In the travel world there are, generally speaking, two kinds of travel companies: the ones striving to offer something for everyone and those like Un-Cruise Adventures who are quite content, thank you very much, to provide everything for someone. To put it so simply even I can’t misconstrue, there are generalists and there are specialists. Honesty compels me to admit that there are a myriad of places in the world where Un-Cruise is simply not an option. They do serve five incredible destinations, however, and should you long to experience one of those, congratulations are in order. You have just won the travel equivalent of the Powerball lottery! OK, that might be slight hyperbole but it is definitely your lucky day. You see, regarding those destinations Un-Cruise Adventures does offer, they are all over them like “white on rice”. (If you are not familiar with that expression you need to listen to last Sunday’s segment on PBS radio’s A Way With Words.) If you are a regular reader, you are probably not shocked to learn that this is my favorite radio program. So which five destinations are we talking about? Some of you have already cheated and looked closely at the image above and know the answer. If you are over fifty, that bit of skullduggery was likely of no help anyway since, like me, you probably can’t read print that small. If you are looking for your reading glasses, they are on your head. On the Un-Cruise website there is this nice quote from Henry David Thoreau, “We need the tonic of wilderness. We can never have enough of nature.” Un-Cruise offers more than a dozen different Alaska cruises ranging from 7 to 21 nights. If you enjoy wildlife (presuming that term doesn’t conjure up images of table dancing at Senior Frog’s in Cancun), you will be pleased to discover that every one of these adventures teems with God’s creatures. You will encounter such diverse creatures as humpback whales, orca, bears, wolves, deer, bald eagles and all manner of sea birds. I would venture to guess that, unless you are from the Pacific Northwest, most of you are like me and unfamiliar with the seductive sounding San Juan Islands, the Strait of Juan de Fuca, the Salish Sea, Princess Louisa Inlet and the vast archipelago of islands that grace the coasts of Washington and British Columbia. Let’s be honest, you were born to have High Tea in Butchart Gardens and to take in nature’s wonders from a kayak or skiff. I know I was! By any chance are you looking for something extremely cool (in both the literal and metaphorical sense) to do this fall or next spring? Without giving away too much about my next post, Un-Cruise Adventures offers four very distinctive styles of adventure. One of these is called Heritage Adventures. I know this is a shameless tease but come back again and I will reveal everything. (Hmm. That didn’t come out quite right!) In any case, if you love history with period costumes, legacy reenactments and dead people walking . . OK, just kidding about the last bit . . you are going to LUV this experience. To cite the Un-Cruise website again, “Just south of California lies an unrushed and uncrowded inland sea known as the Gulf of California, Vermillion Sea, Sea of Cortez or Sea of Cortés. Apparently you can call the thing whatever strikes your fancy at the moment. I sort of like the Sea of Moi but maybe that’s a trifle pretentious. 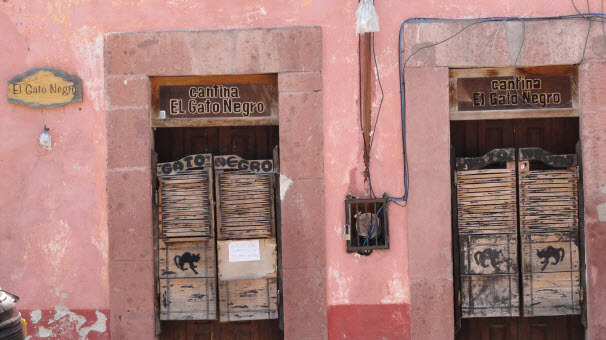 I love the fact that this destination offers an area the writer John Steinbeck referred to as “ferocious with life” but also the culture and beauty of the mission town of Loreto and the rich history of La Paz. Last but hardly least is the ever popular Hawaiian Islands. Captain Cook dubbed them the Sandwich Islands after his visit in 1778 because, according to his diary, he had an incredible pastrami on rye at “The Little Mermaid Dive Shop” on Oahu. See, it’s fascinating little historical tidbits like this you will learn on an Un-Cruise (if you travel with me, anyway). Goodness, time flies when the words are flowing from your keyboard like syrup from a Vermont maple tree. I do seem to recall promising you a little surprise. If you like the fab five destinations, exercise a little patience and in late 2015 — if the dirt doctor hasn’t paid you a house call by then — you can add Costa Rica, Panama and Belize to the list creating the Exciting Eight! When you come back for your next visit (I prefer the assumptive approach), I will tell you about the four very different style of adventures offered by Un-Cruise Adventures. You will discover which one floats your boat, so to speak. Until then, which of the Fab Five destinations appeals to you the most? I seldom, almost never actually, resort to a direct sales pitch on this blog. My theory is to so dazzle you with my razor wit and effervescent charm that you won’t be able to resist checking out our stellar travel offers (a theory not yet validated by actual evidence but I remain undeterred). However, seeing as I pretty much make up the rules as I go along around here, I am going to grant myself the travel equivalent of a special papal dispensation with this post and be blatantly and unabashedly commercial. My rationalization is simple (again, not that I really need much of one). I recently started a new category on this blog called “Hear It Here First” where I promised to share breaking travel news thus ensuring your status at cocktail parties as the “Seer of Syracuse” or wherever the heck you call home. One of our valued travel partners, Royal Caribbean International, promotes a giant, three-day blowout sale just twice a year they call their WOW SALE (hence the title of this post). As special partners, they have given us a little heads up on this offer which does not launch until this coming Monday, February 25th and ends Wednesday, February 27th. 1) Book any sailing departing on or after May 1, 2013. 3-Day WOW Sale includes cruisetours and sailings on their entire fleet! * For a fuller explanation of terms and conditions, click here. Now that you are armed with this advance notice, you can reach out to one of our trusty cruise specialists who will in turn gather information regarding you, your preferences and your immediate travel aspirations. Then come Monday, our agent will pounce like a ravished Bengal tiger and secure the best possible cabin and price before the other hapless rubes out there have finished their morning coffee! Here is a list of some of our cruise experts. When you click on the agent’s name, you will be provided a robust profile and contact information for that agent! Check out a few agents and when a particular agent’s cruise experience strikes your fancy, just reach out to them by phone or email. It really is that easy! If you have been thinking about taking a cruise and have been waiting for the perfect value to come along (we don’t offer deals), act immediately. Hey, I had a root canal this week. This little sales pitch has to be less painful than that! Fonte do Ouro and thereby pique the envy of their fellow enthusiasts, my apologies. Keep in mind, this is a travel blog . . . or purports to be anyway . . . so when we toss the term “port” about we have something entirely different in mind. We are thinking of a facility from whence one launches one’s dream cruise. While Texas may not have yet solidified its position as the port wine capitol of the world, we are rapidly making a name for ourselves as one of the great cruise departure points. Recently I wrote another of my little literary gems called “Galveston oh Galveston: I See Your Cruise Ships Sailing” in which I shared a little chart that explains the current options from Galveston. Since that post, there have been a couple of exciting announcements. Since the cruise terminal has been empty for so long, this is important news for both the city of Houston and the cruise lines. But I suspect it will also raise a lot of questions in the minds of the seafaring public about this new option. Not to worry, dear soul. As usual, your intrepid guide to all things travel related is here to dispense the fog, evaporate the mist, dispel the darkness, shed the light . . . you get the idea. 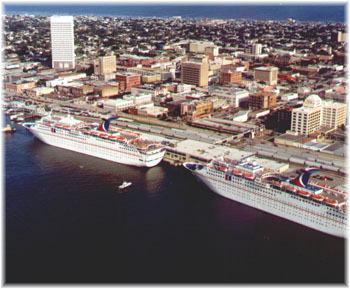 So the two choices that will soon be available to you in Texas are the Port of Galveston or the Bayport Cruise Terminal. Now I realize that a lot of factors will go into your cruise decision such as cruise line, the specific cruise ship, length of sailing, itinerary and ports of call. But once you weight the pros and cons of each port, you may well want to add the port of departure to your list of considerations. One of the most obvious advantages of sailing from Bayport is the availability of numerous flights into both George Bush International Airport and Hobby Airport. While there will be a cost in getting to the pier, unless the cruise lines should decide to provide transfers, it will be less time and money than getting to Galveston from Houston. If your travel plans include either a pre or post overnight stay, Houston of course offers a wide array of hotels in various price ranges. I have not personally been to the new terminal, apparently an experience I share with close to 100% of the population, but I understand it is very modern, roomy and well designed to service cruise customers. One of the chief benefits of sailing from Galveston is the number of local attractions such as the brand new Galveston Island Historic Pleasure Pier. There are plenty of places to stay such as the historic Galvez Hotel & Spa or The Tremont House. The Strand offers lots of shopping options and contributes to Galveston being a fun place to spend an extra day or two. Having choices is always a good thing. Now you can pop over to the Port of Galveston and very soon you will be able to bop over to the Bayport Cruise Terminal. The most important thing is to flop down a deposit on your next cruise. OK, this is getting sappy even by my exceedingly low standards so I’m going to . . . yes, you guessed it . . stop. I have always liked the haunting, Vietnam-era melody penned by Jimmy Webb and popularized by Glen Campbell called “Galveston”. I love the alliteration and especially the vivid imagery woven through the lyrics by the phrases “seawinds blowing”, seawaves crashing” and “seabirds flying”. b) find yourself as easily confused as I am regarding what options are available. My condition actually used to be a lot worse back when I was dyslexic. Fortunately, now I am K.O. Just to make it as easy as possible for you to reach out to me with your next cruise booking, my team of crack researchers (and no, before you ask, we do not research crack around here) have crunched the algorithms, or whatever the heck you do with algorithms, and come up with the simple chart below. This will get you started but you are still going to need expert guidance regarding the differences between these cruise lines, the characteristics of the various ships, the pros and cons of the various itineraries, whether it is appropriate to wear your Tommy Bahamas shirt on formal night, etc. Fortunately, that’s why we skilled cruise specialists spend all those grueling hours sailing through the Gulf and the Caribbean. It may have appeared self-indulgent but we were really fueled by altruism and perhaps the occasional foo foo drink. While we are on the subject of Galveston, it just so happens that this sea port is a very pleasant spot to spend a day or two pre or post cruise. If you are feeling a little too euphoric, you can always visit Moody Gardens and mellow out a bit. Conversely, if your life has been a little humdrum, schedule a visit to the newest attraction in town, the brand new Galveston Island Historic Pleasure Pier. I don’t know about you but I am having one heck of a time getting that tune out of my mind.